Cruel Modernity is the subject of Franco’s forthcoming book on Truth Commissions and surviving the extreme cases of political violence that plagued some Latin American countries in the late twentieth century. 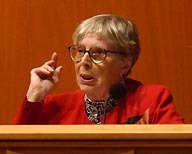 Jean Franco is a British-born academic and literary critic known for her pioneering work on Latin American literature. Educated at Manchester and London, she has taught at London, Essex (where she was the university's first woman professor), Stanford, and is currently professor emerita at Columbia University. Jean Franco's research is wide-ranging and voluminous. She was among the very first English-speaking Latin Americanists to write seriously about Latin American literature. She has particularly focused on women and women's writing. Co-sponsored by the Research Groups of Transnationalizing Justice; Borders, Bodies, and Violence; and Latino Literary Cultural Project; the Chicano Latino Research Center, and the Departments of Literature and Latin American and Latino Studies. Staff support provided by the Institute for Humanities Research.